This 4 bedroom villa with shared pool is located in Lokva Rogoznica and sleeps 8 people. It has WiFi, a garden and barbeque facilities. 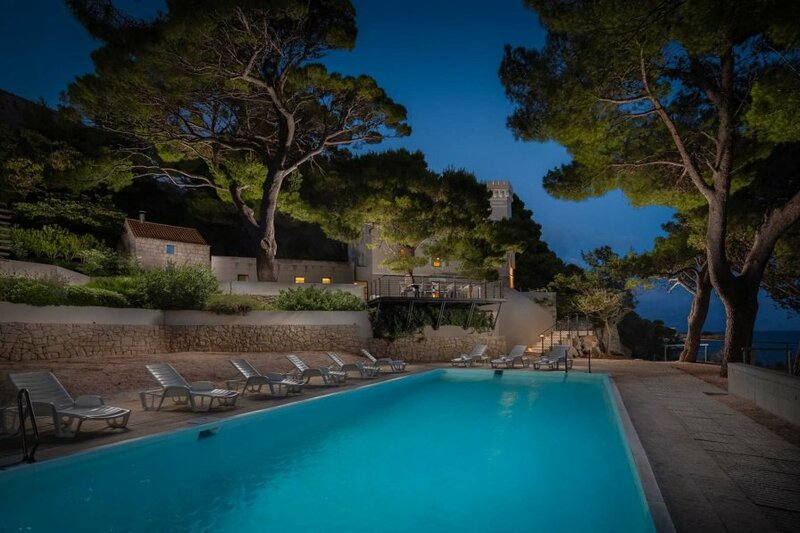 The beachfront villa Castellum with pool has found its place on the coast near the amazing city Omis. The beach and stunning sea are only 10 meters from the villa away. The main feature of the villa is the astonishing garden full of Mediterranean plants and flowers, as well as the sauna, jacuzzi, and tavern. The beachfront villa Castellum has a beautifully arranged living area with a terrace and fully equipped professional kitchen. There are 4 bedrooms where 2 have en-suite bathrooms. One bedroom has a double bed, the second has twin beds and the remaining two have king size beds, meaning the capacity of the villa is 8 people. The outdoors have many facilities. There is a jacuzzi where you can relax after a whole day of exploring Omis. As a part of the house are also a separated tavern and spa area where the jacuzzi and sauna found their place. The barbecue and dining area are separated from the villa, where you besides the modern and luxury interior of the villa can experience the tradition and preparing of delicious meals.